Roast beef is a barbecue lover's go-to roast because it serves well right out of the smoker and makes excellent leftovers for sandwich lovers. You can use any variety of beef roast cuts, some being more tender than others. 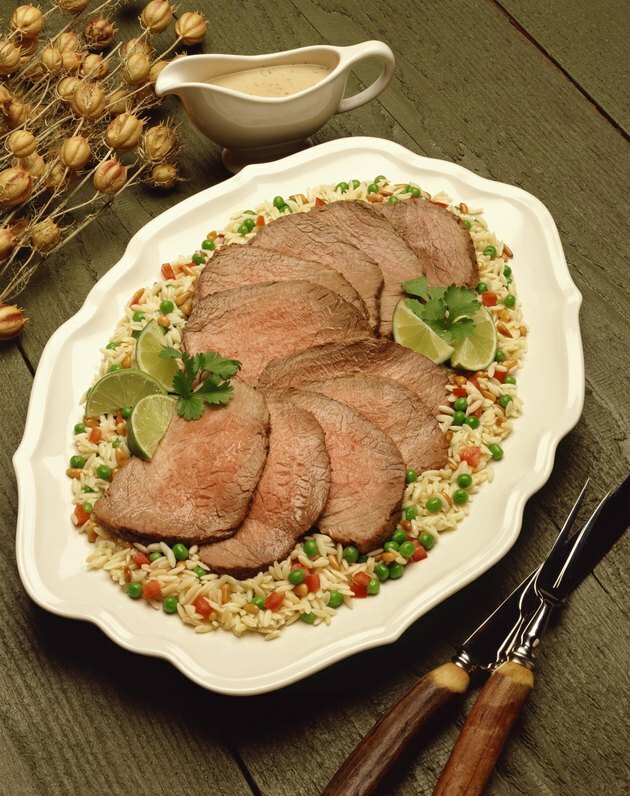 If you are on a budget, you can still enjoy a tasty, tender roast beef by adjusting your cooking time and temperatures with a less tender, inexpensive cut like a round roast. A meat thermometer should read 140 degrees Fahrenheit for rare roasts; medium ranges from 145 to 155 Fahrenheit and well-done roasts register from 160 to 170 Fahrenheit. Start the smoker, setting the flames up for indirect heat. Indirect heat puts flames only on one side. The right side houses the flames while the left side is reserved for placing the meat. Set a water pan under the left side filled 1/3 with water. Allow the smoker to cool down to a low-medium heat around 250 degrees Fahrenheit. For gas grills and smokers, this is a setting on the knob panel; charcoals should be coated in white ember without flames jumping up. Place wood chips over the coal embers to impart wood flavors to the meat. Rub meat seasoning on the roast. Seasoning usually starts with a one-to-one salt and pepper mixture spiced up with cayenne, paprika, onion and garlic powders. The seasoning mix you use should depend on your personal preference. There are no limits to what spices you may want to use as a rub. Other ideas are rosemary, basil, thyme and even a packet of beef gravy mix. Set the meat on the left side of the grill, away from the flames. Close the lid. Smoke the roast for approximately four hours. Add wood chips and water as needed to keep the fire and moisture in the smoker. Insert a meat thermometer into the deep middle of the roast to check the temperature. Marinate the roast overnight. Mix up your favorite dry rub. Use 3 teaspoons of dry rub and add 1 cup of sherry with 1/2 cup of olive oil to coat the meat. Heat the grill to medium heat, approximately 325 degrees Fahrenheit. Light only the right side, leaving the left for indirect heat cooking. Set the meat on the side of the grill with no flames. Close the lid and let the roast cook for approximately 3 hours. Check the internal temperature with a meat thermometer, basting it every hour. When the internal temperature is 115 degrees Fahrenheit, it will be time to sear the meat. Place the roast over the flames for 20 minutes, flipping to brown each side every five minutes. This sears the meat to help lock in juices. Remove the roast from the heat and set it in a dish for 20 minutes to rest before carving and serving.